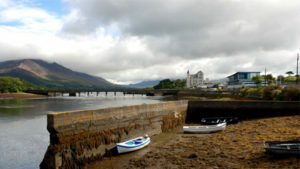 The Kerry Way is a looped walking route starting and finishing in the tourist hub of Killarney. The walking route winds its way around the Iveragh Peninsula taking in some of the most dramatic scenery in Ireland. 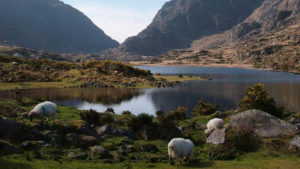 For the first three days on The Kerry Way you will be traversing the foothills of the Macgillycuddy’s Reeks, home to 9 of the 10 tallest mountains in Ireland. 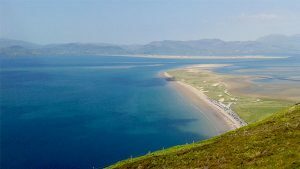 As you get closer to the coast, the hills will become softer but you will welcome them as they provide you with the perfect vantage points to take in the views of the stunning Kerry coastline. 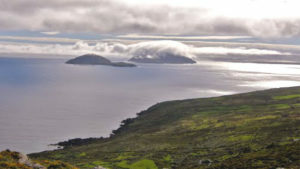 From the colourful coastal village of Waterville you will turn East towards Kenmare, hopping on and off the Wild Atlantic Way and Ring of Kerry coastal route before rejoining the trail to make the most of the Atlantic coast views including Puffin, Scarrif and Deenish Island. Your last day of walking sees you walking North from Kenmare, through Killarney National Park and back to Killarney town. 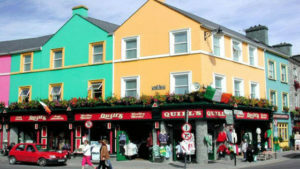 Killarney is the ideal location for a few days of rest and relaxation after your walking tour. This bustling country town is packed with good restaurants, bars and traditional pubs. Take a stroll around the Tudor/Victorian-style Muckross house with its traditional farm and walled gardens. 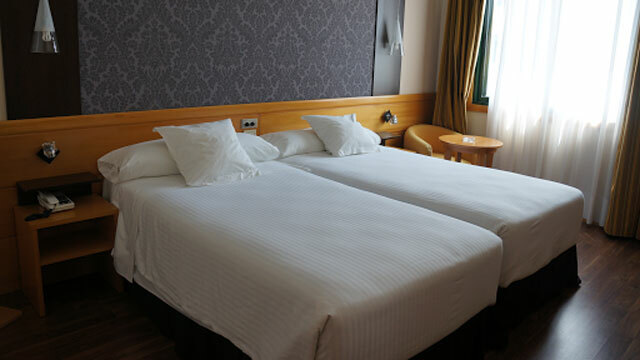 We have planned this walking holiday so your accommodation is close to or on the main trail; and where possible you will stay in the major towns along this stunning route. Read our blog to learn about the highlights of this tour. The kingdom of Kerry has many 5 star reviews. You will leave the town of Killarney walking on country roads switching to well maintained trails. 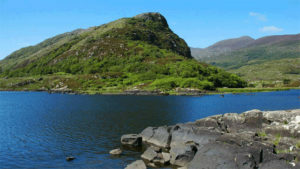 After just a few kilometres you will have entered the Killarney National park, passing the 18th century Muckross house and gardens, continuing along forest and hilly trails to your accommodation in the Black Valley. 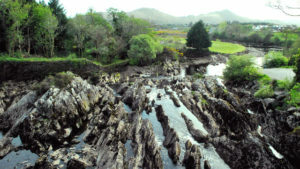 As you enter the Back Valley, you will be climbing into the foothills of the Macgillycuddy reeks, with every step you take uphill, it improves the view of where you have walked from earlier, giving you a sense of how big and beautiful The Killarney National Park is. 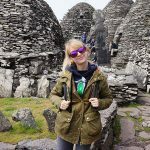 After a hearty breakfast you will be hitting the trail again, walking along rural lanes or boreens (Irish: boithrin, meaning a little road) and breaking trail for mountain paths. You will follow rural roads along the Black Valley with Broaghabinnia Mountain on your left and Carrauntoohil on your right ( it is one of those Valleys that makes you feel small), the terrain will change to forest trails as you contour Brassel Mountain. From the Killarney road to Brida Valley the terrain is quite rocky and caution should be taken in this area especially if it is wet. You will walk past Cummeenduff Lake at the southern end of MacGillycuddy Reeks in the Ballycullane Valley all the time descending towards your accommodation for the evening. A shorter walking day to help you recover, today you will be following the river Caragh for a few hundred metres north along rural roads and forest trails till you come to Drombrane Lough on your right. 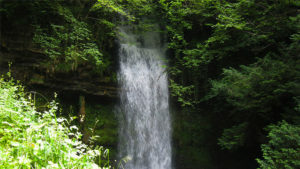 You will rejoin a boreen for 500 meters approx before switching back to Lickeen Woods (a mixed forest trail). From here you are slowly ascending towards the col between Seefin and Coolroe which will offer excellent views of Inch point (AND ITS BEACHES) and the Glenbeigh coast. From there it is all down hill to Glenbeigh, where you will be staying this evening. Note: There is an alternative route to Glenbeigh which is more scenic, however it is longer at 18km. You can look forward to a nice days walking today starting in the village of Glenbeigh, over the Behy Bridge before veering left following forest trails, boreens over rolling hills and mountain trails to Cahersiveen. You will be spoilt for choice with panoramic mountain and coastal views stretching from either side of the trail. 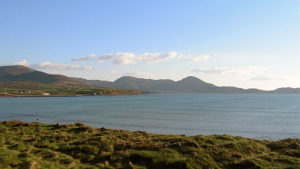 Along the length of the Kerry Way there is a wealth of historic and cultural sights, holy wells, standing stones, ogham stones and artifacts, there seems to be a distinct concentration of the sights around the coastal towns of Cahersiveen and Waterville. You will be transferred back to the Kerry Way. Leaving Cahersiveen you will gradually gain altitude along the ridge to Keelnagre till you reach the top of Knockavahaun 371m (from this vantage point you will be able to look out onto Beginish, Valentia and Church Islands) then it is a steady decent to Canuig and the colourful sea side village of Waterville. This will be a short day allowing you a restful morning in Waterville or you can leave for Caherdaniel as normal to arrive after lunch time, giving you the whole afternoon to explore the town. The walk from Waterville to Caherdaniel is quite relaxed along a mixture of lanes and mountain trails, but this area is dotted with historic sites like standing stones, Chillin (in Irish it means little church or burial ground) Megalithic tombs and Ogham stones. The route from Caherdaniel to Sneem along the Kerry Way is slightly hilly, nothing too steep or high (highest point Gortamullin 205m), the route is mainly on boreens, forest tracks and mountain trails. Ascending these hills and gaining elevation will open up spectacular views of the many small islands off the coast and The Berra peninsula with its weathered coastline and sheltered harbours. Hopefully refreshed from your short day yesterday, you will be happy to tackle todays walk. Even though it is a long walk it is fairly flat with no major ascents to mention. Walking along rural roads and lowland mountain trails, with the sea to one side and the mountains on the other, it is a great way to wind down your trek. 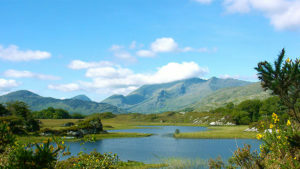 The last leg of your journey on the Kerry Way will see you return to Killarney National Park. Walking along boreens, the ground under foot will be firm and undemanding, walking in the shadow of Peakeen Mountain 555m on your left and Knockanaguish 509m on your right, it offers the perfect terrain and scenery to allow you reflect back on your time walking along the spectacular Kerry Way. After breakfast your tour with us is over. Luas – Dublin Tram service. All our trips include; Holiday Pack and maps, selected accommodation with private bathroom, 24/7 support during your trip and GPS data files. You will also have the option to add or remove the Luggage transfers (one bag up to 20kg per person), bike rental and airport transfers. Flights are not included.